It snowed on Tuesday and was 70 on Wednesday so that can only mean one thing… it’s springtime in the Carolinas! We stopped by the Ballantyne Goodwill store with our friend and fashion insider Stacee Michelle to find stylish looks for this transitional season. The store was recently remodeled to make it easier to find great fashions at a fraction of the price! If you like these looks, you’re in for a treat. We’re partnering with our pal Stacee to curate fashionable finds from a different Goodwill store every month for you to purchase! At noon on the first Friday of the month, a rack of clothes that were “Styled by Stacee” will be released in a Goodwill store so you can bring some of Stacee’s style inspiration to your own wardrobe. The April “Styled by Stacee” rack will be released at the Ballantyne Goodwill store at noon on Friday, April 5! Find some patterns to add excitement to your looks. Just remember – prints are personal! Not everyone will like the same print, so don’t feel like you have to match the print trend of the moment. Instead, pick a pattern that fits your personality! Plus – don’t be afraid to mix prints to create an outfit that’s truly stylish! Take a walk on the wild side! Safari tones are neutral enough to compliment your bright spring colors. Look for shades like camel, olive green and taupe to pair with your spring staples. “Living Coral” is the Pantone Color of the Year for 2019, and it’s the perfect color for spring. Choose prints with pops of coral, or find some great solid coral pieces to highlight in your wardrobe this spring. Goodwill is a great place to find solids to complement your unique prints and mix up your outfits – because the stores are merchandised by color! Denim and shades of blue that remind you of denim can mix with any prints and provide great layering pieces for this unpredictable season. Stacee loves washed denim jackets, vests and chambray shirts to layer for those cool spring nights. Plus – overalls are making a comeback so don’t be afraid to add those into your wardrobe this season! When you’re shopping in the store, feel the fabrics to see if it’s the right material for the season before you pull it out to take a look! Lightweight knits and sheer woven fabrics are great picks for spring (and summer) because they’re breathable and won’t wrinkle as much! 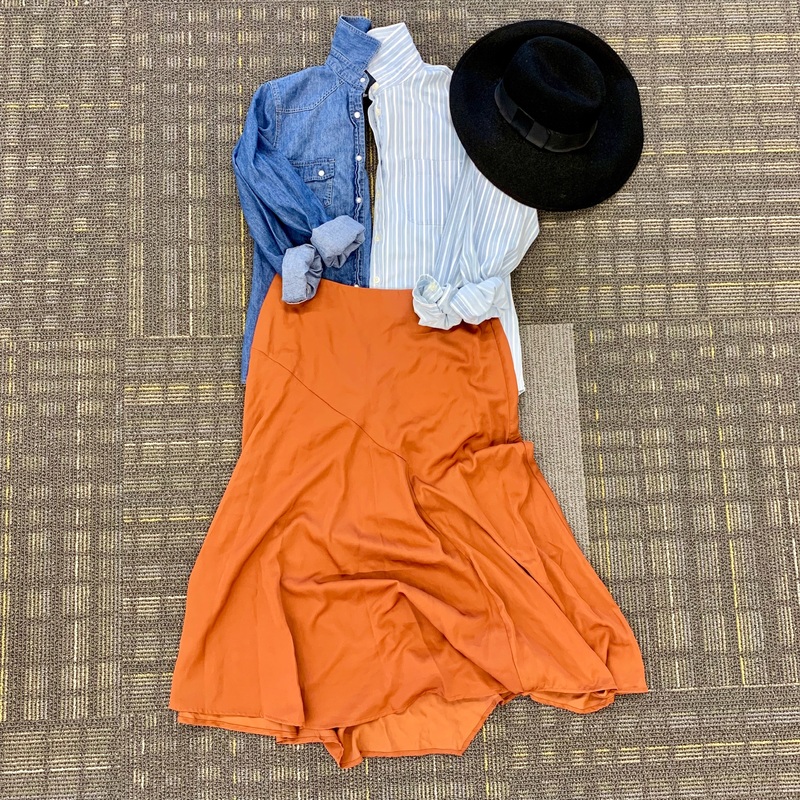 Here are four outfits Stacee styled based on these top spring trends – all of which will be on sale at the Ballantyne Goodwill starting at noon on Friday, April 5 on the Styled by Stacee rack! 1. 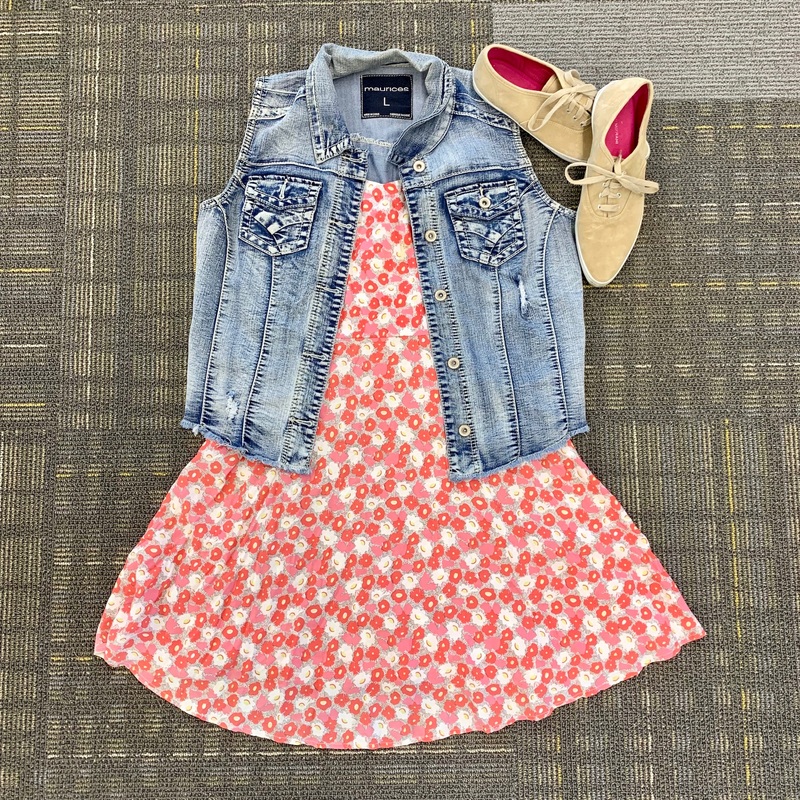 Stacee found this flowy dress with cool cord straps and pops of coral in a beautiful floral print that is just perfect for spring! Paired with this safari-toned moto jacket to keep your warm and these trendy d’orsay flats – it’s an easy weekend outfit doesn’t skimp on style! 2. Safari neutrals let this bright coral blouse shine! The olive green pants and tie-waist top are lightweight knit fabrics that will keep you cool and looking put-together as you enjoy the spring sunshine. Pair it with a straw hat for a touch of boho-chic. 3. Denim and chambray shirts pair well with bold colors – plus the button-up makes for a great layering piece for cooler spring days. 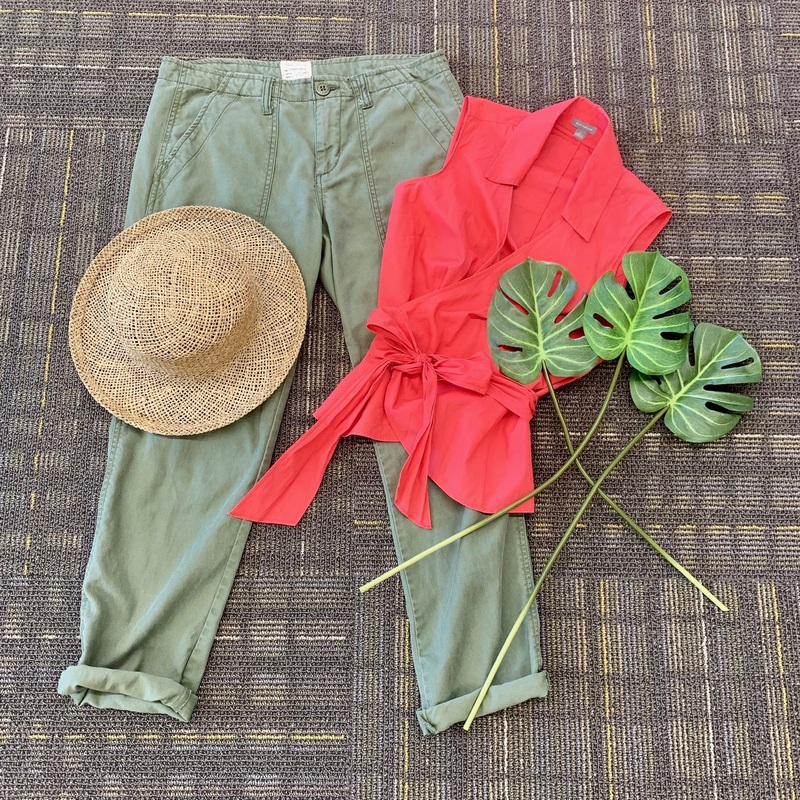 Pair it with a silky skirt in a safari-inspired rust shade and felt wide-brim hat, and you’re ready for a fun day out on the town! 4. Stacee loves this feminine coral-toned dress paired with an edgy, distressed denim vest. Keep it casual with these comfy suede sneakers for a more active day. Follow us on social media @GoodwillSP to get a sneak peek of all of the items Stacee found this month! You can also tune in to Good Day Charlotte on FOX46 Friday, April 5 at 8:15 a.m. to see Stacee show off some of the looks you can buy in the store on Friday. If you can’t make it to the Ballantyne store to shop the Styled by Stacee collection on Friday, you can still use Stacee’s tips to find spring fashions in a store near you!